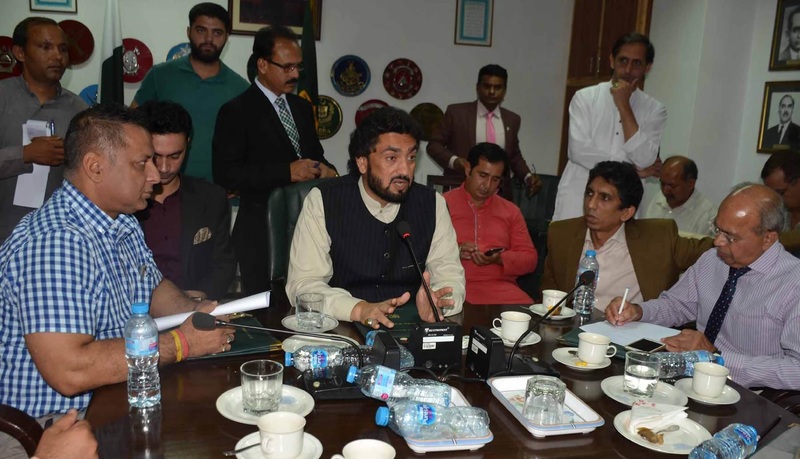 ISLAMABAD: Minister of State for Interior Shehryar Afridi on Tuesday said social media, which was flourishing in the country with each passing day, would be handled in a professional manner while the cyber wing of the Federal Investigation Agency (FIA) would be further strengthened to keep a check on it. He vowed to ensure capacity building of the FIA officers to improve its performance. The agency, dedicated to deal with cases relating to corruption, human trafficking, smuggling, economic and cybercrime etc, would be equipped with modern and innovative technologies, the state minister added. The minister during his interaction with media persons replied queries regarding national security, civil-military ties, passport offices, National Database and Registration Authority (NADRA), Balochistan and ongoing operation against encroachment in the federal capital. The minister assured media that the performance of NADRA and passport offices would improve, adding that a web portal was being developed in the Ministry of Interior to monitor their workings. The minister said the government was giving a clear direction in its first 100 days and for this purpose, the government, under the able leadership of Prime Minister Imran Khan, has constituted task forces. To a question about the ongoing anti-encroachment drive, he said all illegal structures would be demolished without any discrimination and no leniency would be shown in this regard. The minister, who visited Quetta, Taftan and other cities of Balochistan the other day to discuss security of pilgrims (Zaireen), especially during Muharram, said on the special directives of Prime Minister Imran Khan, the federal government would take solid measures for the provision of all possible resources to facilitate the pilgrims. Afridi said during his visit to Balochistan, he also paid a short visit to Pak-Iran border city Taftan and asked the local authorities to facilitate pilgrims and ensure that they do not face any problems or difficulties. He said he also inspected the immigration process, so that the problems of the pilgrims could be solved in a proper way. The number of immigration desks at Taftan would also be increased to 20 to facilitate the pilgrims, he added. Minister of Satate for Interior Shahryar Afridi revealed that around 54 foreign intelligence agencies were active in Pakistan to destabilize the country. He said that they won’t let those succeed who were trying to incite hatred among the people the country, adding that the propaganda against country’s institutions would be foiled. Afridi said that he, along with Chief of Army Staff (COAS) General Qamar Javed Bajwa, would hold meetings with ulemas of all sects in Balochistan, adding that they would also visit various universities and educational institutions along with the ulemas. “Various sects have offered joint prayer in Balochistan, which shows sectarian harmony in the province and the media should highlight this aspect as well,” affirming that uplifting Balochistan is the top priority of the government. The state minister went on to say that 54 foreign intelligence agencies were active in Pakistan to destabilize the country and their agents incite violence in the country. “There will be no compromise on Pakistan s national security and integrity,” he concluded.